When Did People First Come to the Berkshires? How long have there been people in the Berkshires? Hard to know but based on a recent lecture sponsored by Bidwell House there is evidence we had tourists as long as 4,000 years ago. TYRINGHAM — Before Puritan settlers landed on Plymouth Rock, and before Columbus sailed, Berkshire Country residents were already hunting and maintaining gardens. On Saturday, Eric Johnson, archaeology lecturer at the University of Massachusetts at Amherst, gave a talk at the Tyringham Union Church about 4,000-year-old findings from an expedition to the Kampoosa Bog. The Kampoosa Bog in Stockbridge is a dark and swampy lake surrounded by an old growth forest of hemlock, beech and hickory trees. The bog came into existence in the wake of the melting glacial ice, Johnson said, which dates back to about 12,000 years ago. About 20 years ago, Tennessee Gas Pipeline Company had plans to build a pipeline from Western Massachusetts through parts of Eastern New York. Before they began construction, they contacted the Massachusetts Historical Commission for clearance. Archaeology isn’t only about uncovering artifacts buried in the earth; it’s also about analyzing the land itself. In theory, most archaeology sites are preserved as best as they can be in hopes that future years will bring research technology that is less obtrusive. 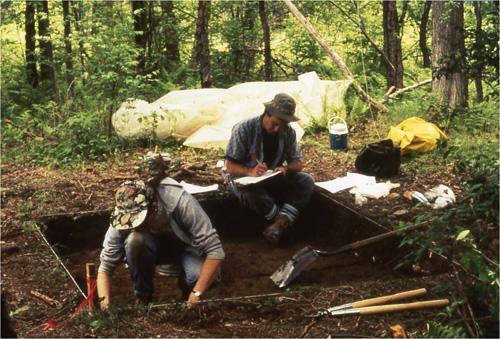 Because there were no alternative paths for the pipeline, Johnson, who worked as a field director, and other members of the UMass archaeology and biology department went to work on digging at the Kampoosa Bog in the summer of 1993. The team used hollow tubes to pull columns of sediment from the bog and analyzed the layers of pollen. The columns, only a few feet long, are estimated to date back more than 11,500 years, based on radio carbon dating. Johnson said people first arrived in New England around this time, following the retreat of the ice sheet that covered the region for thousands of years. Climate and pollen specialists found traces of ash from the forest trees. It’s evident that the native settlers were managing the forest growth by using controlled burning to clear areas of brush, so grass and berry crops could grow freshly. These plants attracted deer and other animals, which benefited the hunters. While digging with their shovels and sharp mason trowels, archeologists found pieces of pottery, scraping tools, and spear heads, Johnson said. The spear heads were fewer than three inches long and had a small stem at the base where they could be attached to a shaft. According to Johnson’s findings recorded in the book “Discovering the Ancient Past at Kampoosa Bog,” 95 percent of the stone material came from chert, a fine grained, glassy rock well suited for making chipped stone tools. Chert is a material found in the Hudson Valley and other parts of eastern New York, which suggests that these natives relied on trade for supplies. Only 5 percent of the stone tools found were made of quartz, which was locally available. It seems people occupied the settlement only for the fall and winter months to harvest plant and animal resources. Before leaving the area, the natives buried a bag of nine unsharpened blades to be used later. Along with tools, the team found at least 33 pottery vessels used to store, carry and cook food and other essentials. The openings ranged from three inches to one foot across and were mostly made of chert and soapstone, which is resistant to breaking when heated. No research has been done on the construction site since the construction of the pipeline 20 years ago. It has been some time since Johnson has given a talk on the Kampoosa Bog, but he believes many people will be interested in learning more about this local, archaeological site. Barbara Palmer, executive director at the Bidwell House Museum in Monterey, contacted Johnson because she wanted to learn more about archaeological research in the area.